YELLOWVILLE is not actually yellow, but is a black and very smooth polled bull out of our premier Optimizer herdsire, MAC F1 SUNDANCE 4S. He started off with a light birth weight of 75 pounds but, like most SUNDANCE progeny, his growth curve has only accelerated since that time and he is now gaining spectacularly on test. He is a second generation Optimizer, being sired by the halfblood bull SUNDANCE and out of a Salers / Angus cross daughter of NEW DESIGN 878. 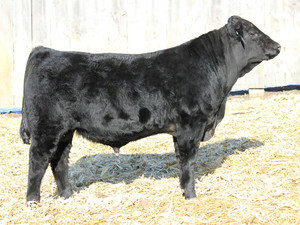 He is an embryo transplant calf whose mother is among our most eye-catching females. She is a moderate-framed, very high capacity female who packages all of her mass into a very feminine, angular and attractive package and tops it off with superb udder design. 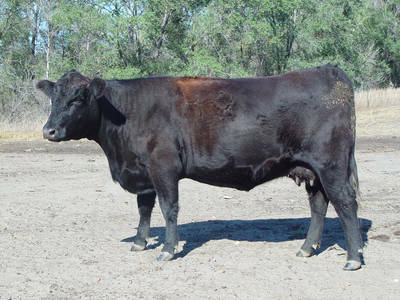 Dam of MAC YELLOWVILLE 21Y taken as a first calf heifer in 2004 just before weaning.